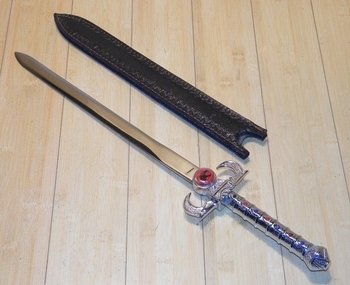 Home > Cosplay Center > Thundercats > Thundercats Sword of Omens (small) Lights Up! ThunderCats is a classic battle of good versus evil. The ThunderCats are humanoids with distinct cat-like qualities, and appearances, while the Mutants are a bunch of goofy looking goons. Thundercats was set on what was called "Third Earth". Both the ThunderCats and the Mutants are from other planets. The ThunderCats left Thundera, their home planet after it was destroyed by the Sword of Plun-Darr's magic. The Thundercats enter cryopods, except for one who stays back to pilot the ship during the long trip. The ThunderCats bring to Third Earth their code of Truth, Justice, Honor, Loyalty, which threatens the evil dominion of Mumm-Ra, an ancient devil priest of First Earth. The Mutants and Mumm-Ra seek to possess the magic Eye of Thundera, the source of the ThunderCats' power, embedded in the hilt of the mystic Sword of Omens. The battle for ownership of the Eye fuels the conflict between the ThunderCats and their enemies at first; but eventually, the Mutants and Mumm-Ra want nothing more than to retake Third Earth in the name of evil and do away with the ThunderCats entirely. In later episodes, Mumm-Ra magically reconstructs Thundera in order to gain the Sword of Plun-Darr and locate the Treasure of Thundera, which harbors the ThunderCats' secrets. Eventually, the ThunderCats return to New Thundera to rebuild their society, while still protecting Third Earth. This is a replica of the Sword of Omens that was carried by Lion-O, Lord of the Thundercats. The sword comes with a light up feature and lights up the cat picture with the push of a button. The sword comes with its own black leather sheath. 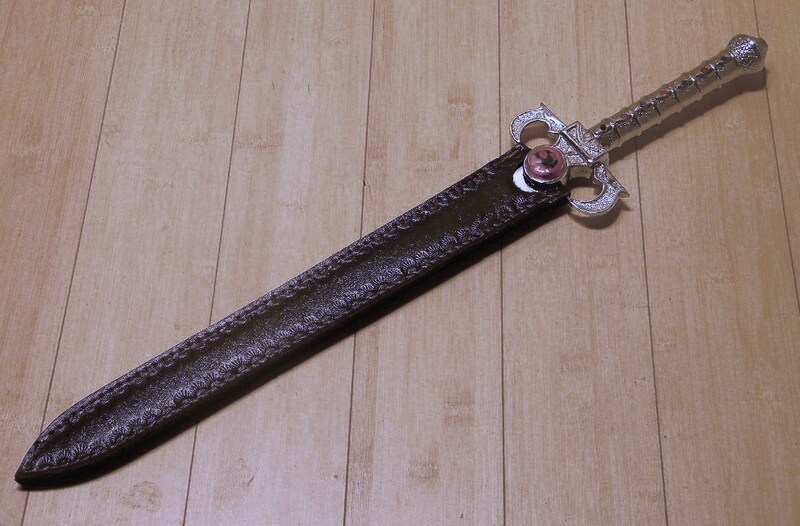 The sword has red and blue stones fixed to the all metal handle for decoration. ▪ Overall Length: 23 1/2"� Out of Scabbard:� 22 1/2"
▪ Blade Length: 14 3/8"